Jyotirindra Basu (8 July 1914 – 17 January 2010); known as Jyoti Basu was an Indian Marxist ideologue, theorist and statesman belonging to the Communist Party of India (Marxist) from West Bengal, India. He served as the Chief Minister of West Bengal state from 1977 to 2000. Basu was a member of the CPI(M) Politburo from the time of the party's founding (The CPI(M) was formed at the Seventh Congress of the Communist Party of India held in Calcutta from 31 October to 7 November 1964) in 1964 until 2008. From 2008 until his death in 2010 he remained a permanent invitee to the central committee of the party. Jyotirindra Basu was born 8 July 1914 at 43/1 Harrison Road (now Mahatma Gandhi Road) in Kolkata (then known as Calcutta) into a very affluent family. His father, Nishikanta Basu, was a doctor settled in Kolkata who hailed from the village of Barudi in Narayanganj District, East Bengal (Bangladesh), while his mother Hemalata Basu was a housewife. Basu grew up in a large Indian-style joint family, consisting of his parents, siblings, paternal uncles, their wives and children. The family, who had lived in a rented house in Kolkata in addition to retaining ancestral properties East Bengal, purchased a spacious mansion at 55-A, Hindustan Road in 1920, and this is where Basu grew up. Basu's schooling started at Loreto School at Dharmatala in Kolkata in 1920, and he was moved in 1925 to St. Xavier's School. While admitting him to school, Basu's father shortened his name from Jyotirindra Basu to Jyoti Basu, and the shortened name stuck for life. After completing school, Basu took an undergraduate degree in English literature honours from Presidency College, University of Calcutta. After completing his undergraduate studies, Basu left for England to study law in 1935. In England, he was introduced to politics and became greatly influenced by the Communist Party of Great Britain. He attended lectures by Harold Laski at the London School of Economics and was also influenced by noted Communist ideologue and prolific writer Rajani Palme Dutt, a fellow Bengali. Between 1936 and 1940, Basu involved himself in various political activities, came into contact with several Indian freedom fighters including Nehru, became a member of the India league, and joined the London Majlis. Basu completed his studies in 1939 and was invited to the Middle Temple as a Barrister in 1939. Shortly afterwards, he returned to India by sea, docking at Mumbai and travelling from there to Kolkata by train. Basu reached Kolkata and was reunited with his parents on January 1, 1940. While he was in London, his parents had selected a suitable bride for him and informed him of their choice. Like a normal Indian boy of his generation, Basu had replied that if the girl was acceptable to his parents, she was acceptable to him. The two sets of parents had then made arrangements for the wedding, and on Jan 20, 1940, only nineteen days after his return to India, Basu was married to Basanti Devi (née Ghose, fondly known as 'Chobi'), a girl of his own caste and similar family background. Unfortunately, Basanti died in 1942, hardly two years after the wedding, and there were no surviving children. Basu's mother, Hemalata Devi, also died a few months later, in 1942. After returning to India, Basu had become an active member of the Communist Party, to his father's chagrin. After Basanti's death, he deepened his involvement, virtually giving up the pretense of earning a living as a lawyer. His legal practice was mostly about providing legal services pro bono to the party and its affiliates, in particular to trade unions. He lived as always with his father and extended family (as per Indian custom) and thus had little need to earn a living. As a young barrister studying in England, he had been a prize catch for any family with a marriageable daughter, but the situation was altered now, and proposals were not plentiful. Several years passed, and Basu's father and other family members grew anxious to see him settled again. In time, they arranged for him to marry another suitable girl of their caste and background. This was Kamala, who Basu married on Dec 5, 1948. The marriage, which conformed in every way to Indian tradition and convention, was harmonious and lasted until their deaths more than sixty years later. On Aug 31, 1951, the couple became the parents of a daughter, born at Sishumangal Hospital in Kolkata. Tragically, the unnamed baby died only a few days later of diarrhoea and dehydration. In 1952, the couple were blessed with the birth of a son, Subhabrata Basu, fondly known as 'Chandan' by one and all. Chandan, who was to be the couple's only surviving child, was born while Basu was in prison for allegedly seditious activities, having been incarcerated by the Congress-led government of independent India. Shortly after Chandan was born, Basu's father, Nishikant Basu, wrote a will which disinherited Basu entirely and vested all his property, a considerable fortune which included the massive mansion in Kokata, in the name of his daughter-in-law Kamala, with provision that the property be inherited by Chandan eventually. The elderly bhadralok patrician had been aghast, even distraught, to find that his beloved son had returned from England a communist, and that he had developed over the next decade (the 1940s) into a violent revolutionary. Basu was to say later that the arrangement suited him perfectly, that indeed it had been devised in consultation with him; it ensured that Kamala was always able to feed the family and pay for her son's education, which left Basu free from the tension of having to provide for his wife and son, and enabled him to pursue his political activities. Jyoti Basu's first track in politics was his effort to organise the Indian students studying in United Kingdom, mostly for the cause of Indian independence. Basu subsequently joined India League and London Majlis, both the organisations being communities of overseas Indian students. Basu was later elected the General Secretary of London Majlish. Basu was given the responsibility for arranging a meeting with Jawaharlal Nehru during Nehru's visit to London in 1938. The same was done after Subhas Chandra Bose went to England. As a member of London Majlis, Basu introduced the visiting Indian political figures to the leaders of the Labour Party. Basu was introduced to the Communist Party of Great Britain by another communist leader and Basu's friend in England, Bhupesh Gupta. It is told Basu showed interest to join CPGB but the then Secretary General Harry Pollitt suggested that he should not do so, possibly because CPGB was then banned in India and Pollitt speculated Basu could have difficulties in returning to India as a member of CPGB. However Basu returned to India in 1940 and immediately contacted the Party leaders. Though he enrolled himself as a barrister in Calcutta High Court, he never practised simply because he was determined to become a wholetimer of the Party. Basu became the secretary of Friends of Soviet Union and Anti-Fascist Writers' Association in Kolkata. As a member of the Party, his initial task was to maintain liaison with underground Party leaders. He was entrusted with responsibilities on the trade union front from 1944. In that year, Bengal Assam Railroad Workers' Union was formed and Basu became its first secretary. In 1944 Basu became involved in trade union activities when CPI delegated him to work amongst the railway labourers. When B.N. Railway Workers Union and B.D. Rail Road Workers Union merged, Basu became the general secretary of the union. In 1946, Basu was elected to the Bengal Provincial Assembly from the Railway Workers constituency. Ratanlal Bramhan and Rupnarayan Roy were the other two Communists who were elected. From that day on, Basu became one of the most popular and influential legislators for decades to come. Basu played a very active role in the stormy days of 1946–47 when Bengal witnessed the Tebhaga movement, workers strikes and even communal riots. In the late 1940s, Basu served as the Vice-President of the All India Railwaymen's Federation until Communists were expelled from the union for attempt to organize strikes after the union had withdrawn its strike notice. Jyoti Basu was the secretary of the West Bengal Provincial Committee of the Party from 1953 to January 1961. He was elected to the Central Committee of the Party in 1951. He was a member of the Politburo from 1964 onwards. He was elected as a special invitee to PB in 19th Congress of the Party in 2008. After the country gained independence, he was elected to the assembly from Baranagar in 1952. He was elected to the West Bengal Legislative Assembly in 1952, 1957, 1962, 1967, 1969, 1971, 1977, 1982, 1987, 1991 and 1996. Though an elected member, Basu was arrested several times during the 1950s and 60s and for certain periods he went underground to evade arrest by the police. In 1962, Jyoti Basu was one amongst the 32 members of the National Council who walked out of the meeting. When the CPI(M) was formed in 1964 as a result of the ideological struggle within the Communist movement, Basu became a member of the Politburo. He was, in fact, the last surviving member of the "Navaratnas", the nine members of the first Politburo. The leftist section, to which the 32 National Council members belonged, organised a convention in Tenali, Andhra Pradesh 7 to 11 July. It was here where the radical sections of party further showed their pro-Chinese stand. The Tenali convention was marked by the display of a large portrait of the Chinese Communist leader Mao Zedong. Basu was elected to the Bengal Legislative Assembly in 1946, contesting the Railway constituency. He served as the Leader of Opposition for a long time when Dr. Bidhan Chandra Roy was the Chief Minister of West Bengal. Jyoti Basu led a number of agitations against the State Government and earned enviable popularity as a politician particularly among the students and youth. Beside organising the movements of the Railway Labourers, he led a movement by the teachers demanding a hike in salary. When the Communist Party of India split in 1964, Basu became one of the first nine members of the Politburo of the newly formed Communist Party of India (Marxist). In 1967 and 1969, Basu became Deputy Chief Minister of West Bengal in the United Front governments. In 1967, after the defeat of the Congress Government, Jyoti Basu was sworn-in as the Deputy Chief Minister under the Chief Ministership of Ajoy Mukherjee. In 1970, he narrowly escaped an assassination attempt at the Patna railway station. Though CPI(M) became the single largest party in the assembly elections in 1971, the party was refused the chance to form a ministry and presidents' Rule was imposed in West Bengal. Through the 1972 elections the Congress returned to power in West Bengal and Jyoti Basu lost the elections from Baranagar to Shiba Pada Bhattacharjee who used to campaign for Basu in Baranagar in earlier elections when the Communist party was united.  . Basu famously declared the new assembly as "assembly of the frauds" and CPI(M) boycotted the assembly for the next five years. After the sweeping victory of the Left Front in 1977, Jyoti Basu became the Chief Minister of the Left Front government, a position he held continuously for a record more than 23 years, until broken by Pawan Kumar Chamling. Under his leadership, the Left Front government focused on land reforms in the state; it instituted a panchayati raj system giving poor peasants and small farmers a say in running the panchayati institutions. The land reforms gave farmers a say on their lands, the agricultural output increased although not as much as expected initially, due to the fact that everyone was a land owner with nobody to sell/supply to, just enough means for self survival. While it was part of fulfilling his electoral agenda, it remained as the only thing worth remembering done by Basu in West Bengal, and that too is not without any critics. Although he is largely remembered as an extremely able administrator who didn't allow any riots in his state after the assassination of the then Prime Minister Indira Gandhi and in 1984 and during the demolition of babri masjid in 1993, while the whole country was on the boil, his excessive pro-people stance resulted in an economic and administrative nightmare. The socialist and populist moves garbed under state sponsored reforms gave way to occurrence of host of factors that resulted into economic nosedive of the state, increased labour militancy driving industries out of the state leaving the state high and dry on resources to thrive. Numerous reports of violence by labours across industries and factories were reported that drove industrialists out. Few prominent indrustrialists pleaded to Jyoti Basu and his administration, but were let down by the response that anyways pinned the blame back on them; Frustrated, the indrustrialists moved out. This emigration of industries gradually led to an increase in unemployment that further became a chief cause of Naxal movement, which ended up being one of the most challenging internal security problems India still deals with. Elections were hijacked, the CPIM workers ran rioting across anyone who opposed them or their stances, one such instance at very beginning of their rule, resulted in an infamous Marichjhapi incident  that led to death of more than 1700 Bangladeshi Hindu immigrants and destruction of properties and goods related to them. Amusingly, the same land reforms which made Basu and left parties overnightly popular amongst villagers and other land owners making them believe that their land was safe and no one could forcibly evict them from it, were undone by then CM Buddhadeb Bhattacharjee to cater the increasing need of industrialization and enforce economic activity in a state that had all its opportunities and resources drained with uncalled for pushing down the socialist policies and reforms at false pretext of aiding the voiceless. Other than labour militancy related violences, electoral booth capturings and Naxali movement getting fuelled in full steam, state remained largely uneventful. In 1996 Jyoti Basu seemed all set to be the consensus leader of the United Front for the post of Prime Minister of India. However, the CPI(M) Politburo decided not to participate in the government, a decision that Jyoti Basu later termed a historic blunder. H.D. Deve Gowda from the Janata Dal instead became prime minister. Basu resigned from the Chief Ministership of West Bengal in 2000 for health reasons, and was succeeded by fellow CPI(M) politician Buddhadeb Bhattacharya. At present, Basu remains as the second longest-serving Chief Minister in Indian political history serving for 23 years 4 months and 17 days behind Sikkim's present CM Pawan Kumar Chamling. The 18th congress of CPI(M), held in Delhi in 2005, re-elected Basu to its Politburo, although he had asked to be allowed to retire from it. On 13 September 2006, Basu entreated the CPI(M) to allow his retirement due to his age, but was turned down. General secretary Prakash Karat said that the party wanted Basu to continue until its 2008 congress, at which point it would reconsider. At the 19th congress in early April 2008, Basu was not included on the Politburo, although he remained a member of the Central Committee and was designated as Special Invitee to the Politburo. In the course of seven decades of work in the Communist party, Basu spent three and a half years in prison and two years underground. After the fall of the Soviet Union and the setbacks to socialism, he provided the leadership along with his colleagues in the Politburo to make a reappraisal of the experience of building socialism and to pinpoint the errors and to correct wrong notions and understandings while remaining true to Marxism–Leninism. He was a Marxist who was not dogmatic and continued to learn from his vast experience in charting out the course for the Party. However, his claims of practicing and implementing Marxism-Leninism turned out to be merely a hogwash, as under his protege, his son Chandan Basu established a multi-crore empire that grew exponentially while Jyoti Basu was the CM and when CPIM retained the governance of West Bengal. This preaching-socialism-while-practicing-capitalism model further dived to another level when the empire set by Chandan Basu was embroiled in legal challenges, namely Housing Board Scam  and a excise related scam , adding to the list of ridicules for the communist party and becoming one of the key factors that led to its departure from governance. He emerged as the pre-eminent and most popular leader of the Party, but he always worked as a disciplined member of the Party, setting an example for all. In his long career in the Party, he undertook various responsibilities including being the first editor of People's Democracy. He had a lifelong association with the trade union movement and was the Vice-President of the Centre of Indian Trade Unions since its inception in 1970. Some commentators feel Basu was more of a democratic socialist than a traditional Communist. "He made Communism look respectable," according to Sabyasachi Basu Roy Choudhuri, a Calcutta-based political analyst. On 1 January 2010, Basu was admitted to AMRI hospital (Bidhannagar, Kolkata) after he was diagnosed with pneumonia. On 16 January 2010, his health condition became extremely critical and he was suffering from multiple organ failure. Seventeen days after being taken ill, he died on 17 January 2010 at 11:47 am IST. The death was followed by public mourning on an unprecedented scale. Draped in the national flag, Basu's body was escorted through the streets of Calcutta on a gun carriage. However, the time schedule went awry in his last moments as lakhs of people thronged the streets of central Kolkata to pay their last respects. Police and volunteers wore a helpless look as a sea of people poured in from every possible corner of the city. The Army escorted the cortege from the State Assembly to the Maidan through Red Road . At MoharKunj, arrangements for the state Funeral had been made. The army buglers performed the last post as twenty one Gurkha troops fired a 21 volley rifle salute. A day of Mourning was declared nationwide as President Pratibha Patil and Prime Minister Manmohan Singh led the nation in mourning. Tributes poured in from politicians across the country. While Patil said "the nation has lost a veteran and eminent public figure," Manmohan Singh said Basu was a politician to whom he often turned for "sagacious advice". Basu was a leader "who displayed his abilities as a leader of the people, an able administrator and eminent statesman", the president said in a statement. "In the years after he relinquished the Chief Ministry, he continued to be looked upon as an elder statesman, whose advice was sought by many political leaders in the state," the president added. In a message to Jyoti Basu's son Chandan, Manmohan Singh said: "He was a powerful regional voice in the national political scene and helped to strengthen Indian federalism... He was a man of great integrity with a deep commitment to secular values." He added:"I have personally had a very long association with Basu. On many occasions in my career, I turned to him for his sagacious advice on all matters, whether they related to West Bengal or to issues of national importance". Vice President Hamid Ansari said Basu had left behind a void that would be difficult to fill. "His sagacity and leadership at both the state and the national level have been a source of inspiration and guidance," Ansari said in a statement. The Communist Party of India-Marxist (CPI-M) that Basu led for several years expressed "profound grief", saying he was a Marxist who was not dogmatic. "Jyoti Basu was a Marxist who never wavered in his convictions. He was a Marxist who was not dogmatic and continued to learn from his vast experience in charting out the course for the party," the CPI-M politburo said. "There will be none like Jyoti Basu again," was how CPI-M general secretary Prakash Karat saluted a man he had prevented from becoming the prime minister in 1996. Karat, who influenced the CPI-M to block Basu from taking charge of the United Front government in 1996, said that the former West Bengal chief minister "was a great leader of the CPI-M, the Left movement and India. With his passing away, an era has passed". Communist Party of India (CPI) leader D. Raja paid glowing tributes to the Marxist patriarch, saying he could have proved to be a great prime minister. "He (Basu) proved that the coalition of Left parties would work successfully and serve the people greatly. He could have proved to be a great prime minister also," Raja said. Former Lok Sabha speaker and Communist leader Somnath Chatterjee said he had lost someone like his father. "When things started to go bad (in Left front), he was sad. He was sad about what happened with me. I used to consult him on all matters. For the second time, I have lost somebody like my father," said an emotional Chatterjee. Finance Minister Pranab Mukherjee said he would miss a well-wisher. "In his death, I have lost a great well-wisher, and the country has lost an able administrator, an outstanding parliamentarian and a charismatic political leader," Mukherjee told reporters. The Bharatiya Janata Party (BJP), the staunchest anti-Communist force in the country, mourned the death of the Marxist leader, describing him as a "role model for Indian politics". In a moving tribute, senior BJP leader Arun Jaitley told reporters here that Basu, who was West Bengal's chief minister for 23 long years, was one of the "tallest leaders" in Indian politics with "high credibility". "He was devoted to his ideology and played the longest innings in Indian politics," Jaitley said. Former prime minister and senior BJP leader Atal Bihari Vajpayee said Basu's demise had "ended a chapter in the country's politics". Home Minister P. Chidambaram told reporters in Kolkata: "He was a colossus who straddled India's political scene for many decades. Not only the leader of West Bengal, but of India. He was a great patriot, great democrat, great parliamentarian and great source of inspiration. He served the people of India to the best." he said. Basu had pledged to donate his body and eyes for medical research on 4 April 2003 at a function organised by Ganadarpan and Susrut Eye Foundation in Kolkata and not to be burned at a crematorium. His eyes are donated to Susrut Eye Foundation. He is survived by his son Chandan, daughter-in-law Rakhi, grand daughters Payel (Mallika Basu), Doyel (Bithika Basu) and Koyel (Juthika Basu), offsprings of his first daughter-in-law Dolly (separated with son Chandan in 1998), and grand son Subhojyoti, offspring of daughter-in-law Rakhi. His second wife Kamala Basu had died on 1 October 2003. Basu's body was kept at 'Peace Haven' for those who wanted to pay their respects. His body was handed over to SSKM Hospital, Kolkata for research on 19 January 2010 around 16:50 pm IST after a guard of honour at the nearby Moharkunja park (formerly, citizens' park). The hospital authority is considering preserving his brain. The Trinamool Congress-run government has decided not to rename Rajarhat New Town after Jyoti Basu. The renaming proposal was a part of the New Town Kolkata Development Authority (Amendment) Bill, 2010, passed in the assembly during the Left Front regime. A programme was even held at Rajarhat in October 2010 on the township's renaming. ^ Obituary: Jyoti Basu Archived 18 January 2010 at the Wayback Machine 17 January 2010 BBC News. ^ a b "Jyoti Basu will continue on Central Committee". The Hindu. Kolkata: The Hindu. 4 April 2008. Archived from the original on 1 November 2008. Retrieved 6 January 2010. ^ a b c Chatterjee, Manini (3 April 2008). "Nine to none, founders' era ends in CPM". The Telegraph. Calcutta: The Telegraph. Archived from the original on 21 February 2010. Retrieved 6 January 2010. ^ a b c d e f g h i "Jyoti Basu : Brief Life-Sketch". jyotibasu.net. Archived from the original on 31 January 2010. Retrieved 5 February 2010. ^ "Life Sketch of Jyoti Basu". cpim.org. Archived from the original on 24 July 2011. Retrieved 17 January 2010. ^ Basu, Jyoti. Jatadur Mone Pare: Rajnaitik Atmakathan. Calcutta: National Book Agency. 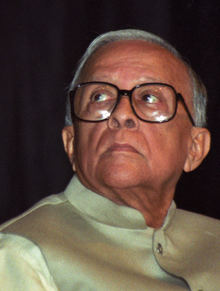 ^ "Political biography: Jyoti Basu". Archived from the original on 20 February 2009. Retrieved 7 January 2010. ^ Roy, Amit (18 January 2010). "London, the land that turned Basu into a Marxist". telegraphindia.com. Kolkata. Archived from the original on 26 January 2010. Retrieved 7 June 2010. ^ Bandopadhyay, Sekhar (2009). Decolonization in South Asia: Meanings of Freedom in Post-independence West Bengal, 1947-52. Routledge. Retrieved August 4, 2017. ^ Basu, Pradip. Towards Naxalbari (1953–1967) – An Account of Inner-Party Ideological Struggle. Calcutta: Progressive Publishers, 2000. p. 51. ^ "Shouldn't have contested, says man who defeated Basu". Shiv Sahay Singh. Indian Express. 19 January 2010. Archived from the original on 5 March 2016. Retrieved 24 October 2015. ^ "How communism killed Bengal's economy". India. Indo-Asian News Service. 19 March 2018. Archived from the original on 10 July 2018. Retrieved 9 July 2018. ^ Chakravarthy, Manas. "Basu raj: West Bengal's historic blunder". LiveMint. Archived from the original on 9 July 2018. Retrieved 9 July 2018. ^ "Land Reforms in India" (PDF). India. Indo-Asian News Service. June 2010. p. 12. Archived (PDF) from the original on 28 March 2016. Retrieved 9 July 2018. ^ "Marxist who almost became India's PM". The Economic Times. India. Indo-Asian News Service. 17 January 2010. Archived from the original on 19 January 2010. ^ Bhaumik, Subir (11 September 2006). "Left veteran just wants to retire". BBC News. Calcutta: BBC. Archived from the original on 26 January 2010. Retrieved 6 January 2010. ^ Mitra, Sumit (30 July 2013). "Comrade papa's Capitalist son". India Today. IT. ^ Subir Bhaumik (17 January 2010). "Obituary: Jyoti Basu". BBC. Archived from the original on 18 January 2010. Retrieved 17 January 2010. ^ "Jyoti Basu admitted to hospital". NDTV. Kolkata: NDTV. 1 January 2010. Archived from the original on 26 September 2012. Retrieved 6 January 2010. ^ "Jyoti Basu put on ventilator, condition serious". Hindustan Times. Kolkata: HT Media. Press Trust of India. 6 January 2010. Archived from the original on 5 June 2011. Retrieved 6 January 2010. ^ "CPM patriarch Jyoti Basu passes away". The Economic Times. Kolkata: The Economic Times. 17 January 2010. Archived from the original on 20 January 2010. Retrieved 17 January 2010. ^ "W Bengal bids tearful adieu to Jyoti Basu". The Pioneer. Kolkata. 20 January 2010. Archived from the original on 22 December 2015. Retrieved 15 August 2010. ^ a b "Nation mourns Jyoti Basu's death". Hindustan Times. Kolkata. 17 January 2010. Archived from the original on 6 June 2011. Retrieved 15 August 2010. ^ "Basu to donate his body for research". indiatimes.com. 4 April 2003. ^ "Masala moments". www.telegraphindia.com. Archived from the original on 30 October 2018. Retrieved 30 October 2018. ^ "CPM patriarch Jyoti-Basu passes away". The Times of India. 17 January 2010. Archived from the original on 20 January 2010. Retrieved 17 January 2010. ^ "Larger than life". The Daily Star. Dhaka. 20 January 2010. Retrieved 7 June 2010. ^ "Doctors mull preserving Basu's brain". sify.com. 19 January 2010. Archived from the original on 24 January 2010. Retrieved 7 June 2010. Menon, Ramdas (28 January 2010). "The Legacy of Jyoti Basu". Majumdar, Diptosh (18 January 2010). "Jyoti Basu, the last Bhadralok Communist". ibnlive.com. Retrieved 7 June 2010.